Besides colourful portraits of citizens from the central Balkans, Beta Vukanovic was also interested in landscapes. Motives from Macedonia, Serbia and Bosnia are among the most important items of her work. 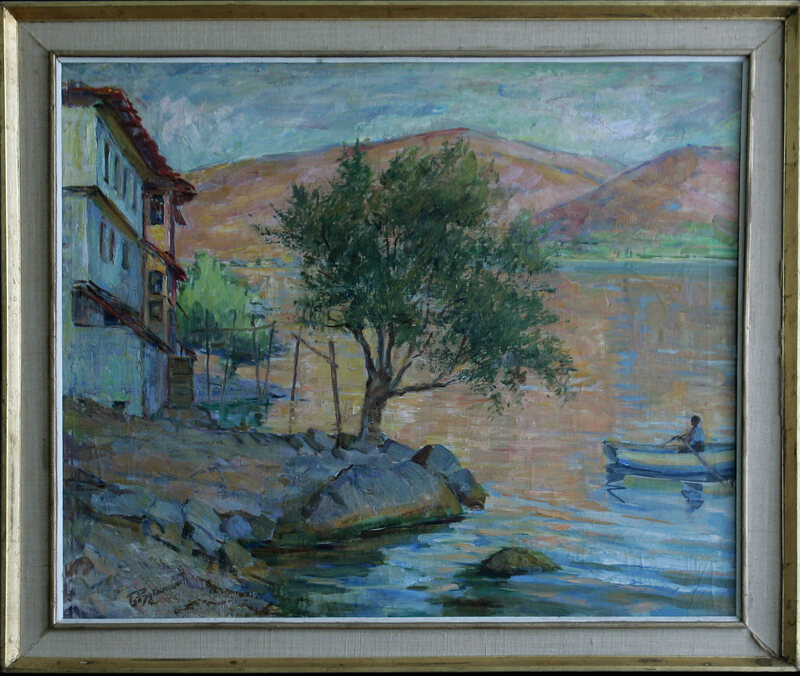 An Ohrid Lake painting from the Royal Art collection is part of that opus. Beta is working in plein-air and that is in a sense an upgrade to her impressionistic manner. Her landscapes are characterized by accentuated drawings and solid form, but also very specific pallet of colours still under strong influence of Impressionism. Those characteristics are obvious at Ohrid Lake. 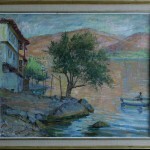 The Ohrid Lake painting is located at the Royal Palace. The archives of President of the Republic states that this painting came to Royal collection in 1958, after it was bought directly from an exhibition organized on the 60th anniversary of work of Beta Vukanovic. Beta Vukanovic was born in Bamberg, Germany as Beta Bahmajer. After education in the private art school of Karl Mar and Anton Azbe in Munich and stay in Paris (1898) she came to Belgrade where she works as teacher at Art school (1905-1936) together with her husband Risto Vukanovic. Beta Vukanovic was an Impressionist, and she adopted that style in Munich. She taught her students to work in plein-air. In her later works there are accentuated drawing, solid forms with impressionistic pallet. She worked on portraits, landscapes and still life. Beta was among the few artists who worked on cartoons and is considered to be founder of artistic cartoons in Yugoslavia. She was one of the founders of the first artistic association in Serbia ‘Lada” in 1904 together with Ubavkic, Murat, Predic, Simeon Roksandic and Djordje Jovanovic, and took part in their exhibitions. She exhibited in Rome, Paris and Munich, and received an award for her life work in 1971.